Sterisart® sterility testing redefines standards. An air filter is essential for sterile venting. But if it comes in contact with the culture medium, it can easily become clogged. At the same time, it can pose a risk to your sample as a result of microbial growth. That’s why we designed it with a safety clearance of 1 cm to effectively protect the filter from coming in contact with the culture medium, even if foaming or the slightest vibration occurs. Working in an isolator calls for the highest dexterity and concentration – every single extra manual step can add up to stress. Instead of being sealed in a separate, difficult-to-open package, the easy-to-handle yellow plugs for closing the canisters are right where you need them: in extra pockets directly inside the primary packaging. This facilitiates your workflow and lets you stay focused on your core tasks. With standard gas-permeable primary packaging, you first have to perform a complicated rinsing procedure inside an isolator to flush out residual gas from sterility test units before you can even begin testing. Our gamma-sterilized and gas-impermeable primary packaging entirely eliminates the need for this rinsing step. You can begin right away with sterility testing, saving steps and rinsing liquid. The extra-large, grip-optimized filter caps are directly attached to the vent filters. You'll find this practical – and not only that. The caps connected by a band to the vent filters cannot fall off or touch any surfaces of the isolator so they are safe from contamination. The article ID codes consisting of the lot number, individual number and product number, permit 100% traceability and identification of the materials. No liquid can splash onto the membrane thanks to the anti-foaming inlet flow design. Instead, liquid flows along the interior of the canister, preventing foaming. This along with a safety clearance of 1 cm, or over 2 1/2", from the air filter provides double protection in preventing this sterile filter from coming in contact with culture medium. As a result, this minimizes the risk of microbial growth. Making responsible decisions in final quality control for release of safe products can be highly stressful because every step has consequences – especially when you cannot tell one canister apart from the other. You can readily confuse these in busy-day routines. The two different color-coded clamps on Sterisart® tubing eliminate the risk of confusion, making it easy for you to identify and fill the canisters with the correct media. Now you can work confidently without worrying about such risks. A critical step in sterility testing is sampling from or injecting into a canister. You usually do this by piercing a tube. This conventional method is not only complicated and involves the hazard of injury. It also increases the risk of false-positive results as this compromises the integrity of the closed system. There is a better and safer way: septum closures. The septum technology of our Sterisart® units has been proving its effectiveness for more than ten years as the method of choice for aseptic transfer of liquids. Your sample will remain safely protected against contamination, as the septum ensures a sterile barrier. At the same time, the simple piercing mechanism minimizes your risk of puncture injuries. We will perform validation of your products directly through Sartorius. You can validate your products on your own, and we'll match your expenses by supplying you with the equivalent in free products. Just provide us with your standard operating procedure (SOP) for us to carry out your specific filtration test or ask us to develop filtration tests according to international pharmacopoeias. After completing these tests, we will send you a test report and an SOP. Following the filtration tests, we will inoculate and incubate your samples with the six different microorganisms prescribed by the international pharmacopoeias. After completing validation, we will provide you with a test report and an SOP. For either option, we will need a sufficient quantity of your product, as well as culture media and rinse liquids, if these differ from the standards. We will assume the cost of validation if Sartorius is used as the first supplier of Sterisart® units employed in testing your products. 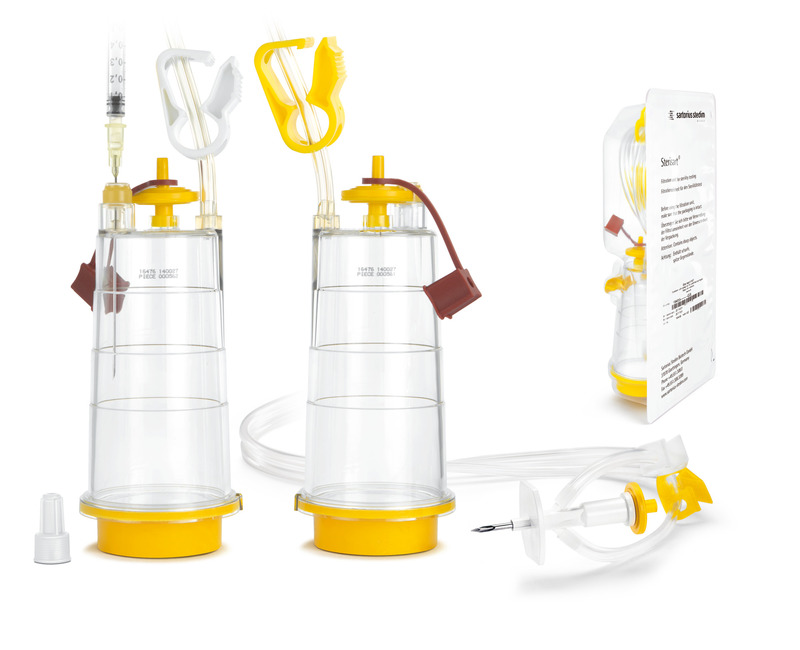 The number of validation procedures Sartorius will pay in this case is initially limited to three (3) of your products. If you would like to have additional products validated, we will be glad to perform validation based on a separate agreement. You will validate your products for final sterility testing using Sartorius Sterisart® units as a preferred, primary or secondary supplier. We will provide you with Sterisart® units free of charge for your particular product validation and will be happy to support you with advice and action. Make an appointment today for an on-site demonstration of Sterisart®. We would be happy to demonstrate the advantages of our Sterisart® sterility testing products in person. Just contact your regional Sartorius sales specialist. Choose your favorite just right for your requirements from over 20 standard units. Any special requests? Let's customize your individual test units together. Sterisart® units are compatible with any peristaltic pump on the market for sterility testing. Our Universal brand peristaltic pump is compatible with all commercially available sterility test units. The Sterisart® consumables have been especially designed to perform sterility tests, and all materials comply with international regulations.